Can we no longer say ‘My Partner’? 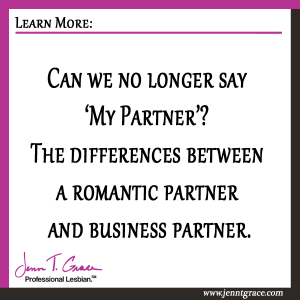 The differences between a romantic partner and business partner. Home » Communications » Can we no longer say ‘My Partner’? 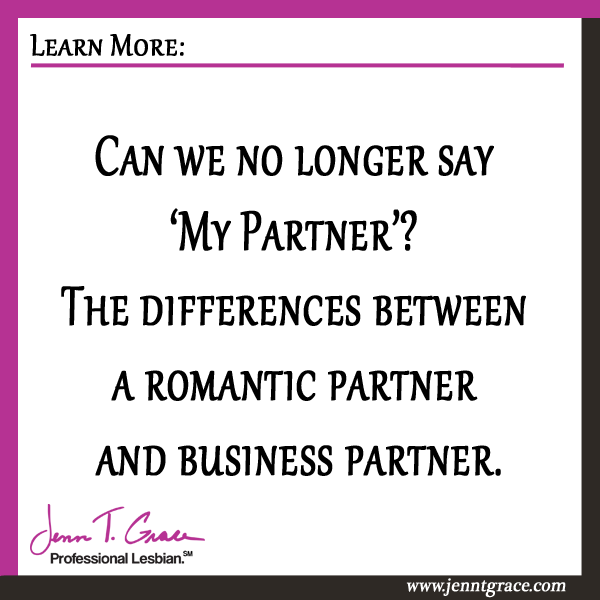 The differences between a romantic partner and business partner. 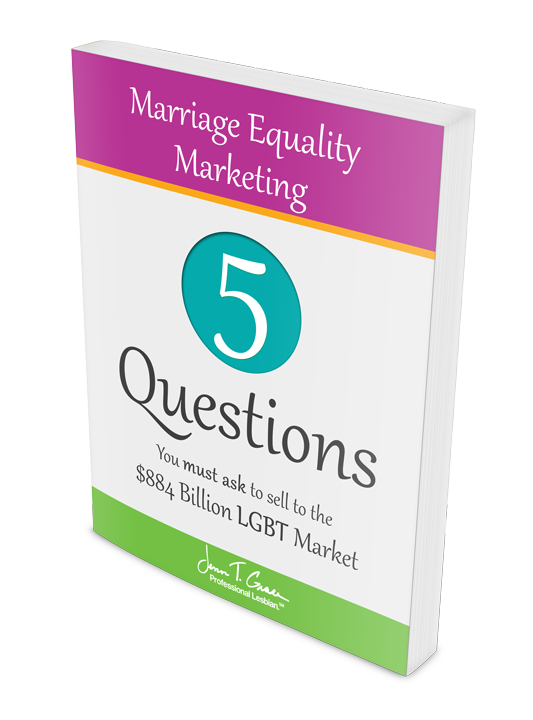 This topic comes from a direct conversation I was having with two women business owners. These two women are active allies and members of the local LGBT chamber of commerce. 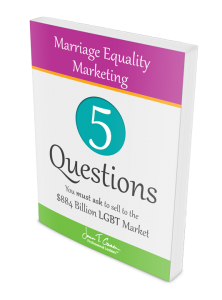 I’ve had a chance to sit down with them in their business, on multiple occasions to talk about how they can be more specific in their marketing to the LGBT community. The two of them have been in business for almost 30 years and at first glance you would think they are sisters. They are family to one another, best friends and business partners. For many years they’ve been referring to one another as each others partner, in the business sense of the word. They began telling me a story of a woman from a local bank who stopped by their business to purchase their services for an upcoming event. The woman cast an immediate assumption that the two of them were a couple when one introduced the other as ‘her partner’. Somewhere during the conversation one of them mentioned her husband, which prompted a conversation between the three of them. Uncovering that they are both married and not part of the LGBT community.  They did clarify that while they are not LGBT themselves they are active and supportive allies of the local LGBT community. As they were done sharing this story, one of them said to me ‘Can we no longer say my partner?’ I was slightly unsure in the moment how to advise them on this. I ended up telling them (and would tell anyone else), that they should consider being more clear and say My Business Partner. I think in this day and age, especially with the advancements of marriage equality, saying partner might lead someone to believe a romantic partner. I would also think though in a business setting that saying partner might be obvious that you mean business partner. My guess is this is all probably based upon what industry you are in. I hear partner in business conversations and usually default to the person being a business partner, but this varies by individual I’m sure. It can never hurt to be more clear in your messaging about who you are, what you do and what your business is about. If you have found yourself in a similar situation, the easiest solution is to clearly state business partner, if that’s who are you talking about. Or if you don’t care if people mistake you for being romantic partners or business partners, then don’t change a thing. These two women are pretty amazing and they don’t mind when people make an assumption that they are a couple so this was more of a rhetorical question to me that sparked a wonderful conversation. 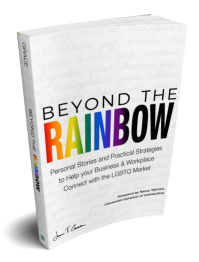 Ultimately as a confident ally reaching out to the LGBT community, if you are mistaken for being part of the community, it shouldn’t be a big deal. I do have a real life example of how this can play out really ugly. If you are interested, click here.